If you’re like the 108 million people who watched last year’s Super Bowl, this Sunday will find you gathering with friends and family for Super Bowl 2014 and I think that calls for a party! In fact, according to the Department of Agriculture Super Bowl Sunday is the number two food consumption event of the year, second only to Thanksgiving. Let’s be honest, you could have a successful Super Bowl party with a TV and a bowl of chips. But we’re going to look for ways to keep your party under budget but over the top! Which brings me to my first tip: Gather the biggest TVs you can muster. Ask around and borrow from friends if you need to and plan on having several TVs so the party can spread out. Designate more than one party area, ideally three, a television room for those who seriously want to watch the game and another space for those who like to chat, and a third for kids or people not interested in the game. Set up this room with cards and board games and have movies or kids’ entertainment in this third area. Put out snacks in all areas. If you want your friends to think you’re a total Diva; hire a kid sitter for the younger kids who don’t yet share a love of the game. Let guests know that their kids are welcome and they can sit back and enjoy the party. To help keep costs down enlist a co-host or two. You’ll save money and time by having a friend help. Choose the house with the comfiest couch and the biggest TV and plan to divide the costs for food and drink and divvy up preparation time. Food — Use items that are easy and self-serve so you can enjoy the party too. A crock of chili could be the cheapest item you have on a frugal Super Bowl menu. Put together an inexpensive fixings bar so your guests can prepare their chili as they like; baked potatoes, chopped tomato and green onion, salsa, sour cream and various shredded cheeses. Serve tortilla chips so the chili can be a dip as well. By limiting the number of dishes, you can cut your food budget significantly. There’s nothing wrong with making your party a potluck buffet, but be clever about it. Ask people what they’d like to bring, and then mix it up. Make sure you don’t end up with three pots of chili and six bags of pretzels. Believe me, guests love to be told what to bring because people really like to help. Quick Appetizer — Heat a block of cream cheese on a plate in the microwave until it begins to soften. 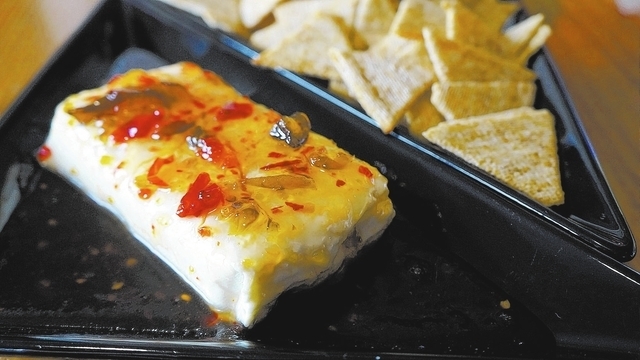 Pour a sweet and spicy sauce, salsa, or my fave — hot pepper jelly over the cheese and serve with crackers. Beverages — Diversity is the key. Have options available including flavored water, sodas, and beer. Let’s be honest, no Super Bowl party is complete without beer. To save money, buy whatever selection of beer is on sale that week at your local grocer. If you’re having a large gathering you might consider a keg. Set up a bar on any flat surface with a plastic tablecloth for easy cleanup. Don’t forget ice, cups and lemon and lime wedges. Frugal Festivity contributed by Patti Diamond author of Divas On A Dime – Where Frugal, Meets Fabulous! www.divasonadime.com Join us on Facebook at DivasOnADimeDotCom.